Nisi Dominus sets the six verses of Psalm 127 (126) for double choir (a high choir of SSAT and an SATB choir) and contains much excellent antiphonal writing with a good deal of rhythmic variety, from the short bursts of triple time to the stately opening of the second half at the words ‘Beatus vir’. 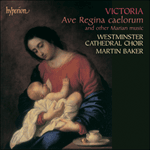 Contrasts of choral registration between the higher and lower choirs, together with sections for reduced voices, are skilfully used by Victoria to provide variety and again he uses triple time in the ‘Gloria Patri’ to set off the expansive final section in duple time. Nisi Dominus reprend les six versets du Psaume 127 (126) pour deux chœurs (SSAT et SATB) et combine une excellente écriture antiphonaire à une variété de rythmes, des éclats à trois temps à l’ouverture majestueuse de la seconde moitié sur les mots «Beatus vir». Les contrastes de registres entre le chœur de voix aiguës et le chœur classique et les passages pour voix réduites sont exploités très habilement par Victoria, et produisent un ensemble bien diversifié. Ici aussi, il utilise la mesure à trois temps dans le «Gloria Patri» pour lancer la section finale majestueuse, à deux temps. Nisi Dominus vertont die Verse 1–6 des 127. (126.) Psalms für Doppelchor (ein Chor aus hohen Stimmen SSAT und ein Chor aus SATB) und enthält viele Beispiele für Victorias ausgezeichnete Verwendung des Wechselgesangs, der sich hier auch durch eine große rhythmische Vielfalt auszeichnet, angefangen bei den kurzen Ausbrüchen im Dreiermetrum bis zum feierlichen Anfang der zweiten Hälfte auf die Worte „Beatus vir“. Die Kontraste zwischen hohem und tiefem Chor sowie Abschnitten mit geringerer Stimmzahl werden von Victoria geschickt genutzt, um Abwechslung zu schaffen. Wieder nutzt er das Dreiermetrum im „Gloria Patri“ als Gegensatz zum umfangreichen Schlussabschnitt im Zweiermetrum. in vain do those who labour build it. futilely does he who watches guard it. you who eat the bread of misery. a reward, the fruit of the womb. such are sons born in your youth. with his enemies at the gate.